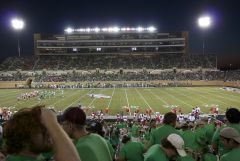 Showing results for tags 'Apogee Stadium'. Why is our athletic staff so small compared to other CUSA schools? We only have two compliance employees, a relatively small marketing team, only one graphics guy on board and only three people working in the ticket office. Is this something we can expect to change in the near future? I read a post on this forum referencing the $26 million debt our athletic department has but perhaps this is one of those times where you have to spend money to make money. Also, I made arrangements to be in Denton for SMU weekend (some have speculated that game could be the first sellout in Apogee history) and would appreciate some recommendations for good restaurants and some fun activities to do with the wife and kids while we are in town. I'm trying to avoid the cliche places like Rudy's and etc. This is a repost from another board in this forum to garner more responses. Why is our athletic staff so small compared to other CUSA schools? We only have two compliance employees, a relatively small marketing team, only one graphics guy on board and only three people working in the ticket office. Is this something we can expect to change in the near future? I read a post on this forum referencing the $26 million debt our athletic department has but perhaps this is one of those times where you have to spend money to make money. Also, I made arrangements to be in Denton for SMU weekend (some have speculated that game could be the first sellout in Apogee history) and would appreciate some recommendations for good restaurants and some fun activities to do with the wife and kids while we are in town. I'm trying to avoid the cliche places like Rudy's and etc. 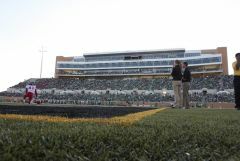 Do you think they will sell beer at Apogee in 2014? What's the verdict on this? SMU, Houston and UT are in. Why not North Texas? 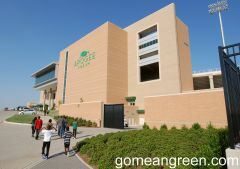 UTSA Fans: "Apogee Stadium, the Dark story"
So a post in the "100 days till UGA" thread took me back to something I've thought about before. We've got the Alumni/ticket season/club level stuff, the student section, and usually an area for the visiting team's fans, and then the general admission area, right? Well, what if there was a small segment reserved for "mixed parties"? Think about it for a minute. It's your home team, so you don't want to sit with the other team's fans...and though we're pretty nice (compared to certain other places one might play football), do a lot of people want to sit in home-heavy areas with their friends even if they're "for" the visiting team? And that's not a rhetorical question, because I haven't been in the situation thus far. So how is it, usually? If your friend or dad or brother went to the other school, do you just kind of say, "I'll go to my section, you go to yours, and I'll see you at halftime"? Or "hey, put on a UNT shirt so you can sit with me and nobody says anything"? If this might actually be something worth pursuing, I wouldn't imagine there would be a huge need for it, maybe just a couple dozen seats or so. But I thought it might be interesting enough to try...a reserved area where friends and family from opposing schools can sit together without being surrounded by fans of the other team. It might even make a few people more likely to come to the game if they know there's an area where they can cheer for their team AND spend time with their friend who attends/attended/cheers for the other school. Thoughts? 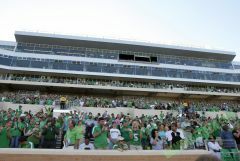 OK so we agree that there will be thousands at the Apogee fireworks show and it is a big chunk of UNT's target audience as Vito stated in his article... The video is fantastic and will leave an impression to some. But will it be enough? It got me to thinking what else could be done at this and other large events being held in and around Denton? Could you have a one page flyer to put on the cars? Perhaps a table with a few cheerleaders or players who happen to be in town? I realize this is last minute but I think that there will be other large events where these types of strategies could be used. Plus it's the middle of summer and things are fairly slow! Any other ideas or thoughts outside the box on this? 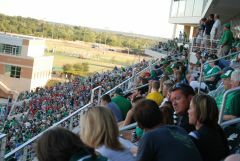 Hey everybody, let me introduce myself as I am new to gomeangreen.com. My name is Chris, I'm going to be starting my sophomore year at UNT this fall. I am originally from Rhode Island, and a relocated family member allowed me the opportunity to open a new chapter in my life in our fine state of Texas. I am a Geography major, and, as you can guess from my presence on this site, an avid UNT sports fan. I may be new to Mean Green Nation, but that doesn't mean I'm not every bit as passionate a fan as the rest of you, young and old a like. I was there for the opening of Apogee, I was there in Hot Springs this year, and I'll make damn sure I am front row at the 50 in the student section for all the football games for the rest of my time as a student here, and I'll attending every home basketball game and traveling with my fellow students up to Hot Springs this year and El Paso (providing there is a student bus, which is iffy given the distance) the following year for our conference tournaments. I'm currently parading myself around Rhode Island this summer sporting my Mean Green gear proudly, as I see others wearing bandwagon clothing (UCONN, Boston College, even occasionally Texas...). Anyways, enough mindless ego stroking, I have a point to make. 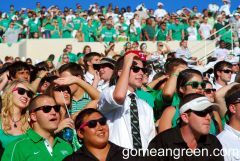 While I am very new to gomeangreen.com, I have spent the last couple weeks reading through this site's forums as a guest, and I've noticed an interesting trend. No matter what the original topic, a large amount of the threads result in stupid bickering; people here seem to hold grudges against each other and it results in unnecessary arguments. I may be new to being a part of this wonderful school and fan base, and may not know the history of our sports teams like a lot of you do, but there is one thing I absolutely know. This is a special, special time to be a part of this university, both athletically and academically. I want everyone I know to be a part of this great time. I am incredibly excited for the upcoming football and basketball seasons, I truly feel that both are going to be incredible this year. But, as a fan base, instead of bickering over pointless things, why can't we join together, and be one? Of course, people have differing opinions over things, and this is the internet, so having arguments or disputes over things are inevitable, but there is a difference between having a constructive disagreement with a fellow fan and having a stupid, petty argument that gets nobody anywhere. Just to clarify, it isn't just this website that I see this trend on. On facebook, there is a page called "Fill Apogee"; the point of the group is to try to get the word out to as many people as humanly possible to try to sell out the home opener. The link of the group will be listed below, for those who are interested in joining. But, even on that group, which is filled with mostly students, petty arguments broke out over whether Texas Southern was a weak team to have for our home opener (not necessarily referring to the team's talent level, but more of weak on our end that that is the best we can schedule), and whether or not FCS is considered D1 or not. This is not only stupid, and irrelevant, but it's also counterproductive. Even if that logic applied (which obviously it doesn't, as anyone who follows college football will understand), the point isn't who we are playing, it is that we are playing. We should go out and support our team 100%, no matter the opponent, and pointless bickering over stupid stuff isn't going to accomplish that goal. Anyways, what ended up happening was a couple players stepped in and commented, Mason Y'Barbo, and none other than Derek Thompson. And I will post what they said. Y'Barbo: All I ask is yalls support. This is going to be a monumental season for us and i want you all to experience it with us. No need for the back and forth name calling and arguing ( though it is amusing). Just please be behind us 100% as one. Thompson: Yall dont really understand how much we feed off of our fans when we step on the field at Apogee. We need this place rockin every time we hit the field! I promise we will put a team out there that will do special things this year. 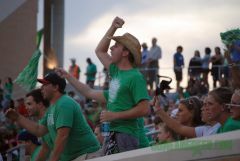 All we ask is that when a home game comes around, that teams never forget the atmosphere at Apogee. Its such a psychological advantage! Hope to see everyone out there this year. Go Mean Green! After these guys commented, the bickering stopped, which is not surprising. And they're right. This is a special team, and it's going to be a special year. If we all put ourselves 100% behind these guys, and believe in them even when times are tough, I really think we can make a bowl game this year. We're going to shock some people in conference play, much like WKU did last year. Same thing with the basketball team, it's really going to be a special year. Especially now with TJ Taylor apparently added, this is really a team that can be top 25, or higher. Who knows, maybe this can be our Butler year? Anything is possible. We have a star. We have a returning supporting cast. We have a new very talented addition. And most of all, they believe they can do it. Just look at the twitter feed from these guys, they believe that they can be the best. Chris Jones seems to think he'll be in the NBA Draft next year. While that is probably silly and not going to happen, these guys have confidence coming into this year. And they have us to back them. So, this is my plea. My plea to North Texas fans everywhere, but starting with you guys. We are one, we stand for the same thing, root for the same team. We are on the same team. Let's fill Apogee. Let's get to a bowl game. Hell, let's win the damn conference, in both sports. Let's make a run in the NCAA Tournament. Let's help Tony win National Player of the Year, and be drafted Top 5. Let's do this, together. We are North Texas, Go Mean Green. 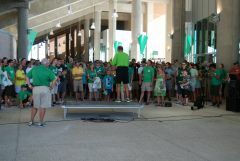 Coach Mac Preaching the Mean Green Gospel!